Challenge new trails with unmatched efficiency and performance. Shimano's XT M8000 11-speed cassette is the key to taking full advantage of the Dyna-Sys 11-speed system. This cassette is specifically designed with a wide gear combination and carefully balanced ratios for you to find that perfect gear on the trail. Through its carefully-calculated Rhythm Step gear progression, the XT M8000 Cassette decreases "shock" and lost power as you shift gears, ultimately delivering smoother and more precise gear changes. Shimano constructs this cogset using a combination of steel and aluminum cogs and carriers, striking an optimal balance between light weight and durability. With Shimano's CS-M8000 on your steed, you'll expand your range to take you to new trails never before possible. Whether you're a rowdy trail rider or an cross-country racer, the XT M8000 Cassette is ready for whatever you can throw at it. Fits exisiting 8/9/10/11 speed Shimano HG freehub bodies, no need for special freehub body. 11-40T and 11-42T cassettes are compatible with Single, Double and Triple chainring configurations. 11-46T cassettes are compatible with Single chainring configurations only. I ordered this to do a 1x11 drive train upgrade on my Giant Anthem. Got this in combination with the new XT M8000 rear derailleur. I am one of those people that shifts all the time so shifting had better work right. My old setup used the XT 10 speed derailleur and cassette with a Wolf Tooth 40T GC, 16T replacement clog and GoatLink. While the old setup was great, this new setup is just flawless. The best part is all works right out of the box. No messing with adjusting the derailleur, B set screws or anything. Totally satisfied. I think the XT 8000 cassette is a better value than most of the Sram 11 speed options, so I use this cassette with Sram shifter and derrailleur. No compatibility issues. I was a bit skeptical about how well the rear would shift to the 46t cog but its has shifted flawlessly so far. (I have an XT rear derailleur with the stock screw.) Having the 46t on the rear allows me to increase the ring size in the front. This is a great upgrade. Love the XT stuff. Would give it a 5 star if the gear splits were better. That jump from 37 to 46 is huge. Would like to see a 40 to 46 instead. I had to wait a long time for this to come available, but it was worth the wait. I was able to put together a 1x11 drivetrain with mostly SRAM components and this XT cassette for a fraction of what it would have cost to use the SRAM 11 speed cassette. Works perfectly with all the X1 components and any standard wheel set. Saved $100s! Older guy trying to fly! Shimano has set the mark with this XT M8000 setup for 1x11and it is reasonablely priced. I swapped out complete drivetrain for under $400(minus crank, I have carbon crank I wanted to keep) Finally got rid of the front derailleur! I went with 30 chainring in front and 11x42 in rear and don't feel like I am missing any gears, other than on climbs in big ring when you want a little more power and less spinning the jump from the 42 to 38 you can feel if you shift during climb.11x40 may be smoother option for stronger riders(I am 55 years old so this is the right setup for me)). Set was super easy and shifting is smooth and easy. I get about 1100 miles out of these before the largest cog is shot. Unfortunately the aluminum used doesn't hold up as well as the steel used for the other cogs. I was having a grinding sound from 13-28t. So I replaced those new teeth with the old ones from my 11-42T keeping just the 32-46 and the grinding sound went away. I just basically bought a new cog but just used the last lower 3 gears. I might be because the chain is 3 weeks old? That's 1 reason I cant think about or those 13-28T are defective. quality product, but I did need to add a spacer between one of the sprockets for my industry nine hub. Quick delivery in a well packed box. Site works great. Order filled and shipped without any issues. Bought the 11-46. Luxury to have the bigger cog on steep climbs. Don't have to have it and an 11-42 worked fine but provides increased efficiency on the harder climbs. Surprisingly smooth shift to the largest cog. 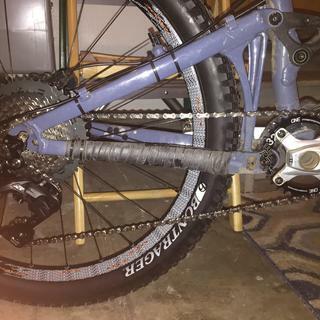 I upgraded my fatbike from 1x10 (X9 shifter and derailleur) using the GX 1x11 rear derailleur, X1 Shifter, M8000 XT 11-42 cassette, and PCX1 chain. Installation was straight forward, and shifting is butter smooth across all 11 including the jump from 37-42 under power. A great set-up for those wanting 11sp. This cassette is great- shifts smoothly, not super heavy, and works with 8/9/10 Shimano/Sram hub eliminating the need for a hub with a special driver (as with Sram...). For a bit more than the price of a new 10sp XT cassette, an extender cog (and its compromised gearing with the removal of the 17t), and a new chain I was able to upgrade fully to 11sp with no compromise in shifting while retaining the full compliment of gears 11-37. Switched to 1x11 drivetrain to replace my old 2x9. Had been waiting until I could get the same range of gearing, so that I didn't lose the lowest gear. The 11-46 cassette shifts great going from a higher gear to a lower gear. The jump from the 37 to 46 tooth cog is very smooth. When shifting from 46 back down to 37, there is a small jump as the chain drops, but it is not an issue. The XT derailleur only required a small adjustment on the b-screw to ensure the inner pulley cage cleared the 46 tooth cassette. Shifting while climbing very steep grades has been flawless and quick. I am running a Shimano chain with this setup. I'm using the 11-46 for my 2005 Trance. I paired it with the 32 oval ring from One Up and an 11 speed XT derailleur/shifter combo. Works great! I was using a 3x9 setup and have been waiting to jump to a 1x setup. I don't feel like I'm missing anything with this setup. The 46 tooth bailout is nice to have here on the CO front range where the climbs can be unforgiving. If you are looking for an affordable 1x setup that works extremely well you can't go wrong with this! Completely changed my 'gravel' bike into a true all-purpose bike that I can also use for touring. Bike had 46/36 chainrings and with 11 x 40 cassette can handle a load on hills, but is still fun (not a slug, like most touring bikes) unloaded on gravel. Absolutely need Wolf tooth road link, cassette spacer, and the medium derailieur if using on a road bike like I did. Takes a leap of faith as DIY project, but worth it. The 11x46 combine with my new RaceFace Turbine 30T (29 in wheels) is just perfect! Shimano XT is the best performance upgrade you'll ever get at prices this low. Matched this cassette up with other XT components for super smooth shifting. Fast shifts and a wide range of gears made my bike feel like a new machine. Awesome price from Jenson as well. Had my eye on a 10spd wide range cassette but pulled the trigger on the m8000 setup instead for only a few more dollars. Very satisfied with my decision. Fresh everything, plus the ease of 11spd without an xd driver. Couldn't have asked for more. Shifts better then anything I've ever had. This cassette allowed me to use my splined wheel set to run the 1x11 rival set up for a gravel grind bike used 11 -42 with the rival derailleur and brake /shifters . Much lighter than I anticipated. I am running the new 1x11 XT group. The entire group together works flawlessly. Absolutely no chain drop when backpedaling (SET YOUR CLUTCH!!!). Super quiet. No chain slap, and I LOVE the ratio. I'm coming from a 2x9 Sram group on my soft tail and I am NEVER going back to a double. I love the engagement with this cassette. This cassette is great. The durability is good so far and gaps between gears is very small and smooth compared to say a 1X10 converted cassette. It really only lacks a 10 tooth small cog to be completely versatile. I've got this on my Hybrid Mountain Goat home build. I'm using it with an Ultegra 50/34 Compact Crankset for a huge gear range to tackle Colorado Mountain Climbs (Mt. Evans, Pikes Peak etc.) but still give me a big enough gear for fast road descents. Shifting is great except for the biggest 3 or 4 sprockets, then things are a little clunkier, but it works. You wouldn't need this set up anywhere in the Midwest, but in the Rockies where we have 17% grades and mile after mile of steep climbing, this gear range on a gravel grinder for this aging Clydesdale weekend warrior has been great. Quick delivery as always and well packaged too. Upgraded to 11-40t from an 11-36 with a 24t chain ring. What a difference 4 teeth make. Shifting is crisp and smooth. Paired it with new XT derailleur and shifter. This was a high quality, lower cost alternative to buying a new XD freehub body to use a SRAM 11 speed cassette. This Shimano XT cassette works with a "standard" 9/10 speed freehub. (A minor downside is that it's only available with an 11T small cog vs SRAM's 10T.) So far, seems perfectly compatible with my X01 11 speed drivetrain... I got the confidence to try it after seeing that some new Niner bikes are configured with this mix "OEM". Great Cassette. Running with SRAM GX. Running this with SRAM GX shifter and mech due to my rear hub.. I have a Shimano style hub so this cassette is perfect. No issues at all running it with SRAM components and chain. Will likely be buying this casssette for a while. No complaints at all. I'm impress that it can work with a shimano slx 11 speed shifter and my upgrade 10t-50t from one up components . Love this cassette. I use to have a shimano HG 10 speed never have a problem with and I step up to this 11 speed which I'm so happy that I could use it to make some good extras on it as I add up a low 10T and 50T hight sprocket . Works awesomely good . Recommend it !! Works great for a 1x11 conversion. Way better price than SRAM. I don't think I will ever miss the 10T cog. The only thing that I regret is that Shimano came with the 46T cassette sortly after I bought the 11-42 one. I never wanted to convert my hips to SRAM so I waited to go 1 x 11 until Shimano released the XT 11 speed groupset. It's the right price and performance for me. Classic XT shifting; clean and fast. I ride a lot of miles and do mostly technical trails with punchy climbs and rocky downs. I also run this on my Fatbike all winter. I run 30t x 11-42t mostly, but sometimes I use a 34t up front. The only weakness is that the 42t cog is aluminum and wears out. Not too fast, but if you grind in the big cog a lot, consider running 28t up front to spread out your climbing gears. 11 is the new 10! Great addition to my 1X XTR setup on my second, heavier wheelset which gives me slightly better range. Typical great Shimano quality and engineering because it shifts beautifully and runs quietly. I expect it to be bomber durable like previous XT cassettes but only time will tell. 37 to 42 tooth jump feels big on the trail, as does the 24 to 28. That's just a personal preference thing though. The 46 tooth option finally pushed me all the way to 1X. However, the Shimano cassette is merely the same as the 42 cassette, just with the 42 replaced with the 46. That means 2nd gear is a big gap to 37, too wide to make sense. Another company offers a 46-40-36 step down, which I like much better. The jump from 37 to 46 is huge. On the upside, once the 46T wears out, I'm pretty sure you can cook a pizza on it. wear out in one year on 37T tooth, ratio is bad, jump from 37T to 46T, never buy again. wear out in one year on 37T tooth, ratio is super bad, jump from 37T to 46T, never buy again. XT parts are the best value in cycling! Shifts beautifully, lasts a long time and the price is really good! Perfect replacement to the original. I replace my M-7000 cassette with the Shimano XT CS-8000 11-42T cassette to have a slightly larger big ring. The conversion was easy to do myself and the end result was exactly what I was after with perfect shifting every time. I have been very pleased with the service I've received. It really works great. I went from a 2by10 to a 1by11 and it works great. These cassettes have a great range and are very light. Perfect 1x11 setup for the money. Its not the lightest, but last a long time and cheap enough to not feel the pain in the wallet. It states the max rear cassette cog is 42t, yet Shimano has their 11spd 11-46t cassettes in this same line, are they compatible with 46t or is there another offering from shimano which is? BEST ANSWER: Hello - If you are running a single front chainring, then you can use the 46 tooth cassette with the GS (medium cage) derailleur. If you have 2 or more chainrings up front, you will need the SGS (long cage) rear derailleur. Thanks Elizabeth, I checked on the Shimano site and all their specs say cassette low gear limit it 42t for this derailleur, but it looks like real world applications says yes, they are compatible with 46t limit. A 46 tooth fits just fine, assuming you are running a 1x setup. Shimano states that the max cog size is 42 tooth for a 2x setup, it just was not clarified on the Jenson site. 46 tooth max for the 1x, 42 max for the 2x. I currently have a 46 tooth ring with an xtr derailer, xt shifter, and a 32 tooth Race Face Ring and it shifts pretty darn good. If you run the 11-46 gear set you have to run just a single gear up front. If you want to use 2 or 3 gears up front then use the 11-42 gear set. I think the Shimano specs state that 11-42t and 11-46t are only compatible with 1x, not 2x. Of course, eal world applications might be a lot different, is this your experience? I am sorry you are correct I am running a 11-42 with a single speed up front. I meant to say 11-40 can be used with a 2 or 3 gear front set up. Thank you for catching that. I run the XTR Di2 rear derailleur with a cassette that has a 46 tooth cog. It runs perfectly. Thanks Leon, I wonder why Shimano has nothing indicating this in their specs online? Seems to be a bit of an oversight. Thanks for the info. That's what the shimano specs say for 2x, but for 1x it's 42. to confuse things further they don't make an XTR 11-46t cassette, Though I suppose based on reader experiences it works fine with 1x 46t limit. I think it is either just an oversight on Shimano's part or theier warranty department didn't want to sign off on it without further testing. Do I need to change rear-wheel hub (or a freehub) to upgrade from Shimano SLX 9-speed cassette? BEST ANSWER: If you wheel was built with a 8/9/10 speed compatible freehub body, then you do not need to upgrade. Shimano 11 speed works with 10-speed compatible freehub bodies. Will this fit to my existing 9 speed hub? BEST ANSWER: Yes, this 11 spd mtn hub will fit on 9,10 speed shimano hubs. Only Shimano 11spd road cassettes require a new 11spd road hub body. Yes, this will fit on the same hub a shimano 9 speed . You may need to a shim, to dial in the exact fit. I'm using this 11-46caset on usual shimano hub, so you will be able to use this on your hub, I think. YES. Did so myself with a Chris King hub that was running a 9spd cassette. Perfect swap fit. Yeah, it should fit any Shimano-style 135mm rear hub. It won't fit a SRAM XD hub, though. Is the 11-46 cassette compatible with medium cage (GS) derailleurs on 1x11 setups? the allowable chain wrap with a single chainring setup is Large cassette cog - small cassette cog which = 35.
the 11-46 cassette therefore would be ok since the chain wrap for the is 35. Derailleur" witch has a medium cage GS derailleiur. The GS RD is not only compatible but prefered. gs for a 1X . SGS is the long cage. IS IT CERTAIN THAT THE 11-42T CAN NOT BE RUN WITH 2 CHAINRINGS? BEST ANSWER: Yes you can run the XT M8000 11-42T cassette as described on the Shimano site. When originally introduced by Shimano the 11-42T was marketed as the only 1x11 setup. Since the introduction of the 11-46T it appears the marketing has changed, but not for the Jenson USA site. 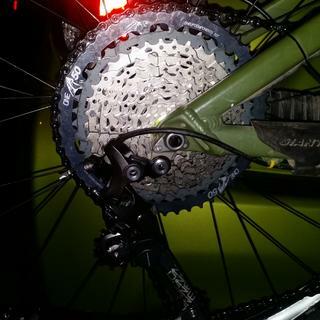 Even so, if you're running anything smaller than a 34/24 chainring you may want to reconsider your overall ratios, as this may be too drastic a change for any wheel size up to 29" I run a 30T chainring with a 11-42T cassette on a 29" wheel 30 pound bike and I can ascend anything except the steepest climbs. A 28T with a 11-42T on a 29" wheel will give me optimum climbing ability. A 28T with a 11-46T would be overkill unless all I was doing was climbing mountains. Consider your previous ratio and where you want to go from there. I went from a 22x34=.64 to a 30x42=.71, compare that to 24x42=.51 Try to find something close to .58 to .60 if the climbs aren't the steepest but if you're doing long steep climbs then .51 may be right in the ballpark. Enjoy. You can run the Shimano M8000 11-40T or 11-42T on your 2x11 setup provided your components are Shimano compatable. 11-46T is specified for 1x11 setup only. This cassette will not work with SRAM derailer or shifters. Shimano says to use regular derailleur for single and long derailleur for double chainring, so it should work. I am running regular derailleur and single chainring however. I have been using the 11-42 with a 48-34 chainring for a month now, with no problems so far, using a RoadLink. The derailleur alignment is critical. No guarantees, of course. Hi there, well is not, you can with 11-42 and with the new one 11-46. The 11-40T and 11-42T both work with 2 front chain rings. Can't say, i'd go with the 1X. I have the 2x10 XT rear derailleur would i have to get a new one or do anything to go 1x11? You will need a new shifter, derailleur, chain, cassette, and possibly a new front chain ring unless you want to keep your 2x. If you are keeping 2x, you'll need a new front shifter, derailleur, and chain rings and/or crank set. No one needs 2x anyway! Unfortunately you would have to change most of your drive train to run 1x11. You would need a 11sp derailleur, shifter and chain. Depending on your crank you could get away with just changing the chainring. If you want to ride 1x11 you should change everything: Crankset, rear derailleur and chain for optimal results. Remember the speed of the chain should match the cassette not the crankset. Which XT model? M8000 series I hope? GS or SGS? Both will work, GS is preferred due to shorter cage length and therefore shorter chain and less chance to hit something. For an 11 speed cassette, you will need an 11 speed rear derailleur and and 11 speed shifter. You will also need a chain designed to fit the 11 speed cassette. In order to shift into all 11 gears correctly, you would need the derailleur as well as the shifter. It's an easy and reasonably priced upgrade. To go 1x11 you will need new derrailleur and shifter. You will need an 11 speed derailer and shifter. Winter time, tinkering time... Can you fit a 11 speed Shimano M8000 cassette on the 150mm x 12mm size hub? BEST ANSWER: my best answer is that without the hub laced to a rim and not yet inserted into a frame, the smallest gear and lockring do allow the cassette to be mounted to the free hub body without any issue., There is however less distance between the shoulder bolt and frame. 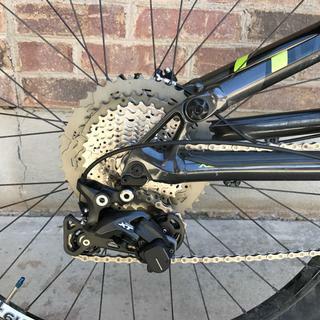 I tried this without the hub mounted and can not say if the distance allows enough space for the chain to fit between the smallest gear and the frame when in the lowest position. P.S. I tried this on the 12 x 135mm option not the 150 mm option. My assumption is that the same distance between the frame and chain will result, as it is the same freehub body on both hubs. 10 speed shimano hubs will work for a 11 speed shimano cassette. 1. Is this going to work with a 1x11 GX derailleur? BEST ANSWER: You can absolutely run this cassette with a SRAM groupset. Perfect alternative if you can't run an XD driver on your current hub. 1. No, you can not use a SRAM 1x11 derailer even though the derailer design is for a wider SRAM cassette spacing, the gear spacing for a 1 to 1 SRAM derailer and SRAM shifter setup differs from Shimano due to the wider SRAM cassette 1x11 design. 2. Yes, you can use the 1x11 Shimano cassette on an Iodine 2 hub as these use a Shimano freehub designed for later 9 or 10 speed and the Shimano 11 speed has the same freehub/cassette spacing. You must use a shimano shifter and derailer to be compatible unlike the 9 or 10 speed gear spacing that is identical to SRAM. I highly recommend Shadow Plus derailer and XTR shifter for optimum performance and compatiblity and cost value. A Shimano chain is recommended as well, as the SRAM gear spacing has increased, so has the chain width, which does not match the Shimano narrow gear spacing to match the earlier 9 or 10 speed freehub/cassette spacing. I did the entire switch and am pleased and have been a SRAM user for the past ten years (buy American) but now I've switched back to Shimano to make this upgrade on two old (6 years) bikes I still enjoy to this day. 1. Not sure about the compatibility considering the GX is SRAM. You may want to contact shimano or seam. 2. I believe there should be no issue running this on the iodine. I put my cassette on a hope pro 2 which was previously running an XT 10 speed with no issues. Yes to both, should work perfectly. I am running currently running a XT 11-42 cassette with a 32 tooth ring and a mid -size derailleur. Am I able to convert to a 11-46 without any adjustments? BEST ANSWER: Nat absolutely certain but I believe you'll need the largest derailleur to be able to run that cassette. You can call Shimano technical support and they can tell you for certain.. I've called them when I had questions about compatibility..
Yep. just change the cassette, it will work great! Besides adding more chain links you will be fine. The 11-46 cog. would the RD GS work with it or the SGS? BEST ANSWER: GS or SGS will both work with the 11x46 cassette.....the SGS may give a little chain slap when ripping the 11 cog in the gnar. While the SGS will work it's primary design was for use with triple chainrings which are not compatible with the 11x46 cassette. Should be a long or mid cage. 1x? 2x? Need to determine Shimano's recommended capacity for the various cage lengths. Capacity = largest cog minus smallest so here 46-11=35. If you have a f. der. then you add the difference on the largest and smallest chainrings to the above number. If you have 3 chain rings up front, get the SGS. Otherwise get the GS. BEST ANSWER: If you have the long cage (as Eduardo noted) - yes. I run this cassette on my BMC with the SRAM Rival setup and it works fantastically as a 1x11 setup (11-42 cassette out back, 48 ring up front). You need to check that the derailuer is a long cage, otherwise you will not be able to use the sproket with more than 36 teeth. Well this fit on a Chris King Ten speed XD Driver for sram? This fits a "regular" sram/Shimano mountain/road 10speed free hub. They dish the big cogs so it fits on the 10speed hub body. With a spacer I would imagine you could use this on an 11speed sram / shimano road free hub. I don't think this will work on an xd driver - also the advantage of the xd driver is you can have a 10t small cog. No. xd freehub will not fit any shimano casettes. No. This is not an XD type cassette. Is this 46T compatible with XTRs (" XTR RD-M9000 11S Rear Derailleur GS Cage"
and "Shimano XTR SL-M9000 11SPD Shift Lever Right, 11 Speed")? Sorry, I do not know. Try MTBR.com in the drivetrain forum. There may be people there who have tried. Yep. If you are putting a single on the front get the short cage derailler. Are using a 1x, 2x or 3x drivetrain? Can it fit to shimano-11speed-road-hub? I love long-ride and i need more large cassette. BEST ANSWER: yes, but it will require a long cage derailleur and a freehub spacer. Yes. But you may need a different derailleur with a long cage. I do not feel the need for more teeth in my cassette. BEST ANSWER: Will work but better to keep the groups....as a group. They are designed to work together and can work between brands, but is not the perfect combination. Yes from what I understand you can. SRAM uses Shimano standards, and they are interchangeable. Minor differences in feel/sound maybe but they'll work. YES it will work. My friend is using X01 setup with shimano 11-46 and its perfect. BEST ANSWER: My answer would be to stick with the double chain ring and go to a 42 or 46. I run a 36x22 with a 11-46 and it works great. If you ride cross country with some steep hills don't worry about a little bit of weight savings it will save your knees. I ride in the desert with a lot of steep climbs and you better be young to climb with a 1x system. The easy way to figure this out is do the math. So, 22/40 =.55, 30/50 = .6, and 30/46 = .65. A 22/40 ratio will be the lowest, thus the easiest on your knees. However you will lose your high speed range, so you will need to balance your needs. Good luck. Thx amigo ,my gear ratio math is lacking to say the least . Your help is much appreciated! As always, it depends. I suggest you use Sheldon Brown's ratio calculator and do the comparisons based on data. This site doesn't allow links so just google Sheldon brown gear calculator. Can I use the 11-46 cassette with Sram Rival 1 rd and shifter? BEST ANSWER: The 11-46 will NOT work on the 1x11 SRAM Rival 1 setup. Largest supported in the rear is 42 (10-42 capable with a long cage). Specs are available on the SRAM website. I use a 48 ring up front and a 11-40 cassette in the rear, really like it. The Rival 1 is pretty bullet proof. You would need a bigger derailleur a longer chain and beside, I don't think the chain alignment would work. 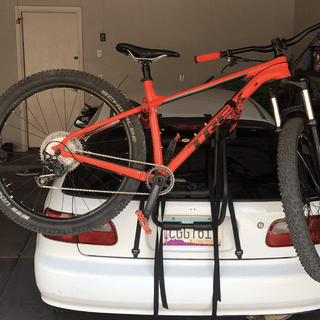 Is different from road bikes to MTB? The smallest chain rings that I'm aware of on road bikes are 33/50.. Likely you may not find a chain long enough?? Should the 11-46 flavor work with a standard XT shadow derailleur? Should the B screw be enough to get the upper derailleur pulley off the cassette when in the 46t cog? BEST ANSWER: Yes, any 11 speed Shimano MTB derailleur will work with the 11-46T just fine without any modifications. I use to have the 11/42 and swaped them to the 46. No problem with my derailleur, as long as its a 11spd you'll be fine. BEST ANSWER: What you need to check is the freehub body style (shimano style or SRAM x-driver) and the width of the Hub. At first sight, your hub has a shimano style body, si I would say yes. BUT the hub is probably not wide enoguh to fit a 11 speed casette. I would personally would upgrade my hubs. I believe there is a sram x9 freehub body that could do the trick. My final sugestion, talk to the manufacturer. I believe it should work as long as the hub flanges are around the same diameter as a shimano 10 spd hub. These cassettes are specifically made to fit shimano 10spd hubs, they do this by having the largest cogs sit concave on the hub. You need to have smaller flanges in order to have the cogs "fit" around it. You can use shimano 10 speed hub with 11 speed casethe but not a sram rear hub. I have a 2010 Pivot Firebird that's been converted to a 1x9 with a Raceface 32T NW chainring. Will this 11 spd cassette fit my DT Swiss 370 hub with 135mm spacing? It looks like my current cassette is a Shimano paired an XT derailleur and SLX shifter. I'm planning on upgrading the entire setup. Thanks! BEST ANSWER: This cassette shoudl fit most any Shimano style 8/9/10 speed hub in 135, 142, and 148 rear drop-out widths. Its ability to work is based specifically on the hub, and if its a Shimano style 8/9/10, you'll be fine. The system accepts, but you should note the model of the rear derailleur that you will use. The most suitable for larger tooth cassettes is the SGS model (exchanges with the longest cages). Can I use an 11-40 with a 42T oval chain ring? This is for a cross bike that is 1x11 and an XTR di2 in the rear. Thanks. BEST ANSWER: Id think you should be able to as long as it clears your chainstay in the single ring's position. 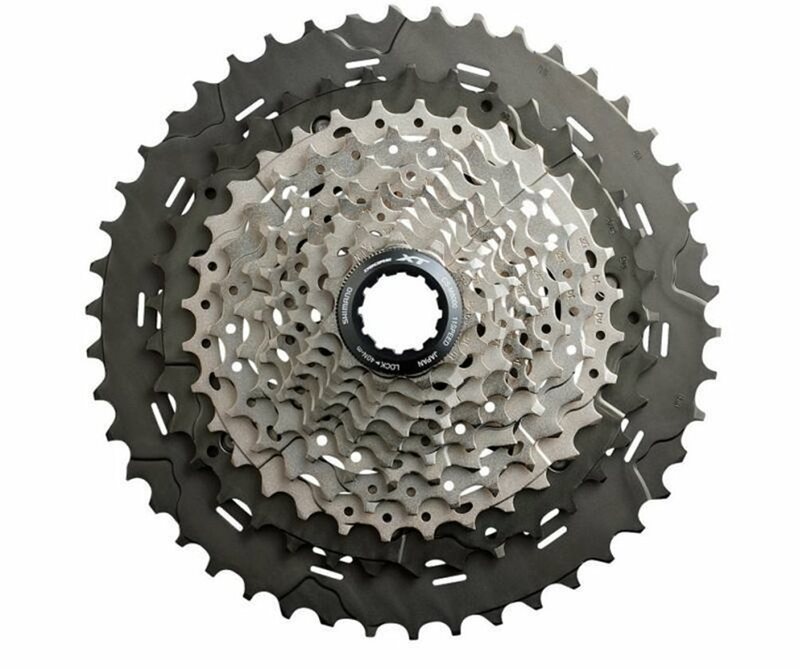 There shoudl be no effect on your ability to use a 42t chainring with this cassette other than clearance for the chainring on your specific bike frame. That should work fine as long as you have the right rear Der. Length. Check your derailleur and then look up the model online to see the range it covers. My guess is if you have the medium length it will be perfect. Will this cassette work with a non xd driver? BEST ANSWER: Yes, works great. Mine is on a standard 10spd hub. If it's a non-XD driver, then it should work. Can you convert a 1-10 to a 1-11? BEST ANSWER: Yes, with a new shifter, cassette, cable, chain, and derailleur. My set up right now is Shimano XT M8000 11-42 and 1x 30 , GS rear derailleur. Would the GS works if I change the cog to 11-46? Not sure, I would not go 11x46. I went with an 11x42, with one up 18t and 45 extender. W/32 oval up front. The 45 is too much of a granny. Now abs black makes a 30 t oval chainring, that would be sufficient for me with an 11x42. Yes, it will work. 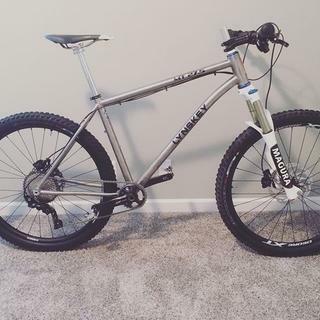 My Giant Trance came with a 32 tooth chainring, 11-46 cassette, and GS rear derailleur. GS rear derailleur has total capacity of 39 teeth. If you run a single up front and a 11-46 in back, your total capacity is 46-11=35. Is this cassette compatible with the RS700 shifter? BEST ANSWER: GS cage, is for 2x, and up to 42t cassette. 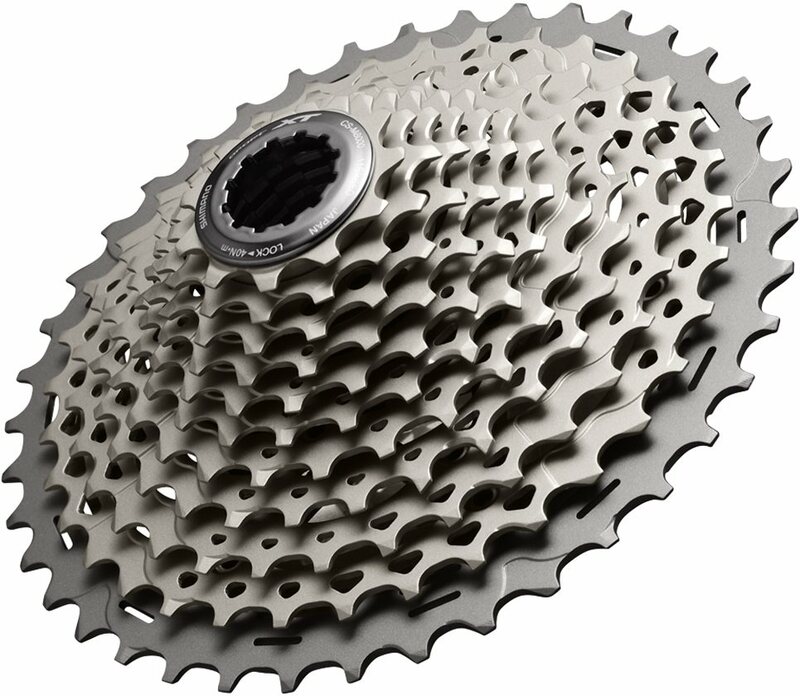 BEST ANSWER: This cassette should fit most any Shimano style 8/9/10 speed hub in 135, 142, and 148 rear drop-out widths. Its ability to work is based specifically on the hub. So, if your hub is a Shimano style 8/9/10, you'll be fine. Are there any compatibility issues I should be aware of with the 46T? Planning to build an XT 1x11 drivetrain with the 30T chainring and med cage derailleur. BEST ANSWER: Based on your description, it sounds like you will be fully compatible, and will have a solid amount of climbing gearing.